Nothing is spookier than a ghost. Just the thought of a ghost sends chills down the spine. 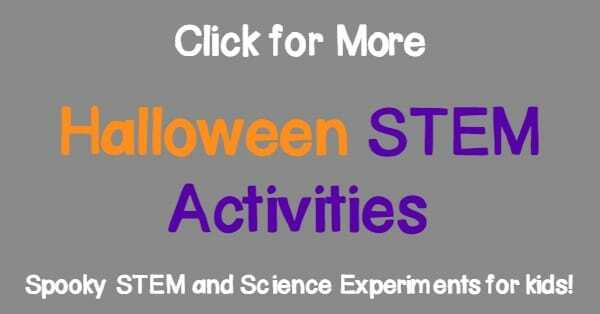 You wouldn’t think the supernatural and science could collide, but in this diving ghost spooky science experiment, science and ghosts combine in a spooktacular Halloween STEM activity that is perfect for October! 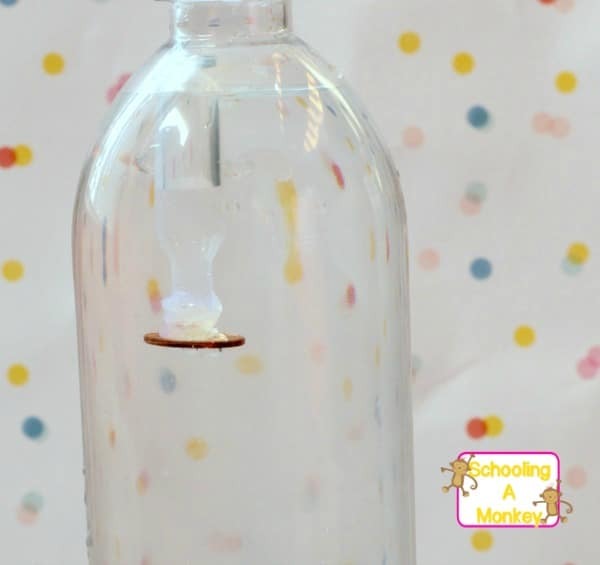 Don’t be intimated by the number of steps in this activity, there are a few things to get right, but if you keep at it, this science experiment really is tons of fun. I love it because it includes more STEM elements than some science experiments, because you have to build your weight system through trial and error before the ghost will rise and fall. 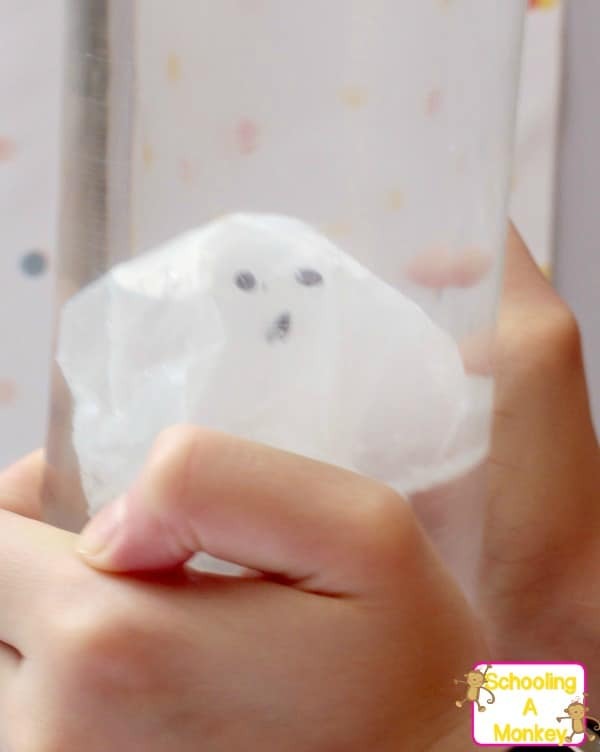 This spooky science activity was one of our favorites, because it really looks spooky when the ghost appears to move on her own! 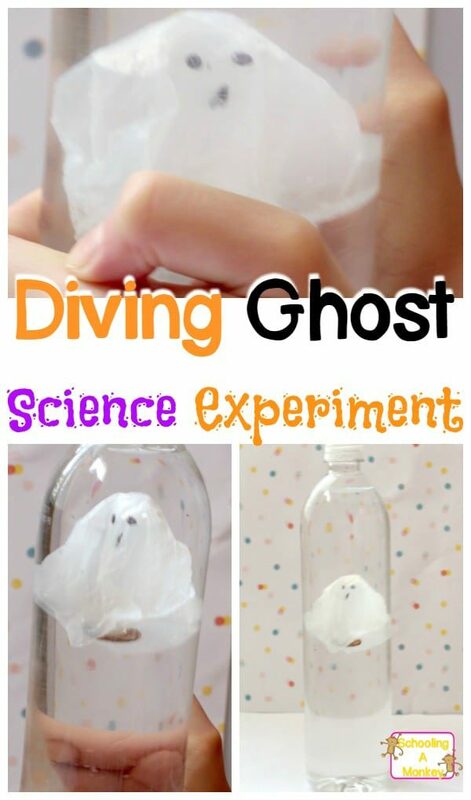 This diving ghost science experiment is a fun twist on the classic cartesian diver science experiment. 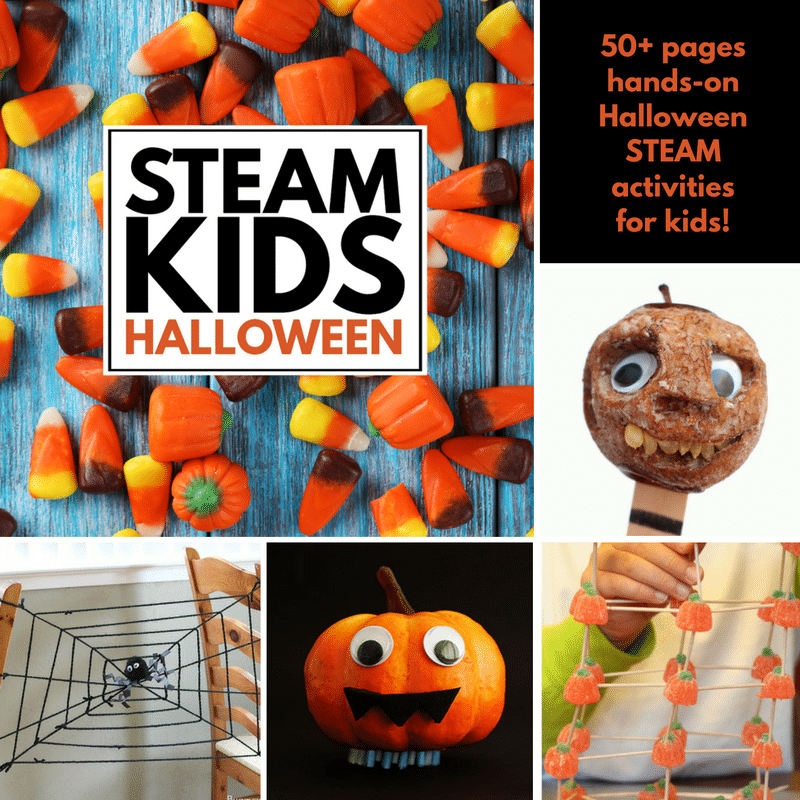 Spooky science at its best! If you don’t want to make your own weight system, you can purchase a cartesian diver kit. 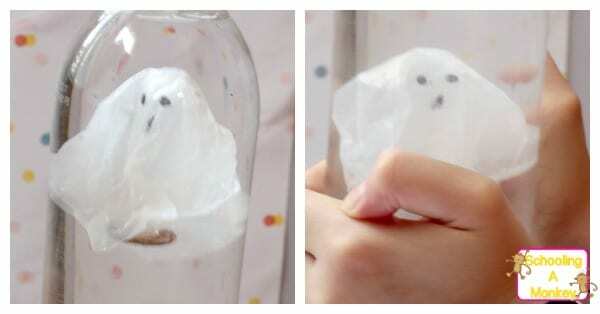 The trick with this experiment is to at JUST enough water so that when the ghost is placed in the bottle, it barely sinks (see the picture for how it should look). If it floats too much, it will not sink no matter how much pressure you have on it. Too little water and she’ll sink to the bottom no matter what. The balance is key, and you may have to play around with several versions before you get it right. Be patient, and explain that redoing things is what the scientific process and STEM activities are all about! First, cut all but about 1/3 of an inch of the eye dropper stem off. You won’t need it. Heat your glue gun while you’re waiting. Next, fill the eyedropper about 1/3 of the way with water (you’ll have to experiment with this). We had almost a half a dropper of water in ours. Seal the bottom with hot glue. While the glue is still hot, stick a penny on it for balance and a little extra weight. Now for the tricky part. Fill your bottle nearly full of water. Place the eyedropper inside. If you did it right, the eyedropper will just barely float above the surface. Add or remove water from the eyedropper until it floats. Screw on the lid and test your diver. It should slowly move to the bottom of the bottle when you squeeze. 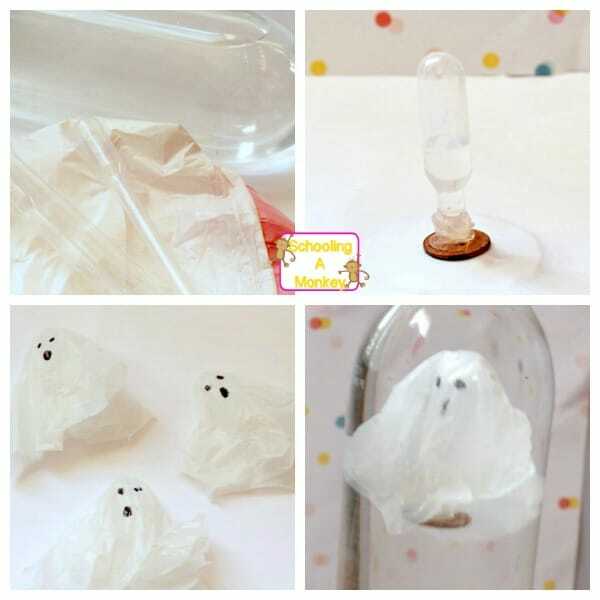 Adjust the amount of glue and water until it can do this before adding the ghost part. Cut a circle from your white trash bag that is a little bigger than your eyedropper head. You want it to be big enough to drape so it looks ghost-like. Glue the circle of plastic over the eye dropper. We did one dab at the top and four dabs of glue around the bottom so it stuck, but could still flow a little. Draw a face on your ghost with the permanent marker. When you squeeze the bottle, the water level goes up. This causes increased pressure inside the eye dropper, compressing the air. The compressed air increases the density and mass of the ghost, making her sink to the bottom. When the pressure is released, Miss Ghost floats right back to the top! 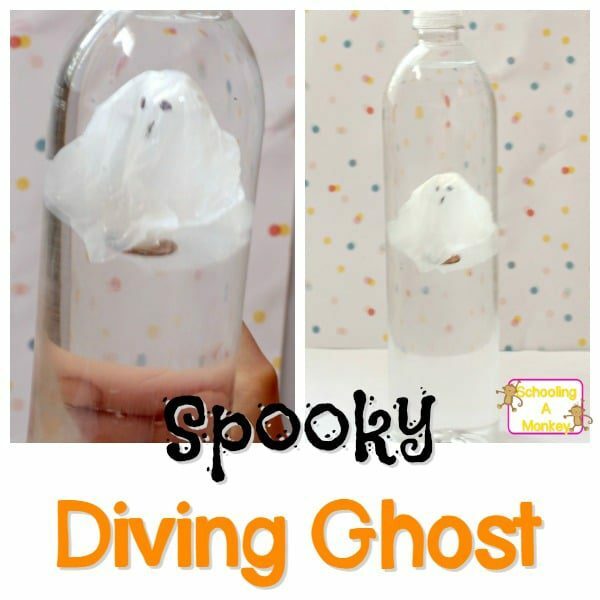 We noticed that our ghost was easier to sink on rainy days.